Tensile Architecture can be used in unusual applications to provide solutions to design challenges. Inside the foyer one of the new biotechnology buildings at Monash University, the noise was too elevated, as sounds from the cafe on the ground floor reverberated off the hard wall surfaces made from stone and glass. 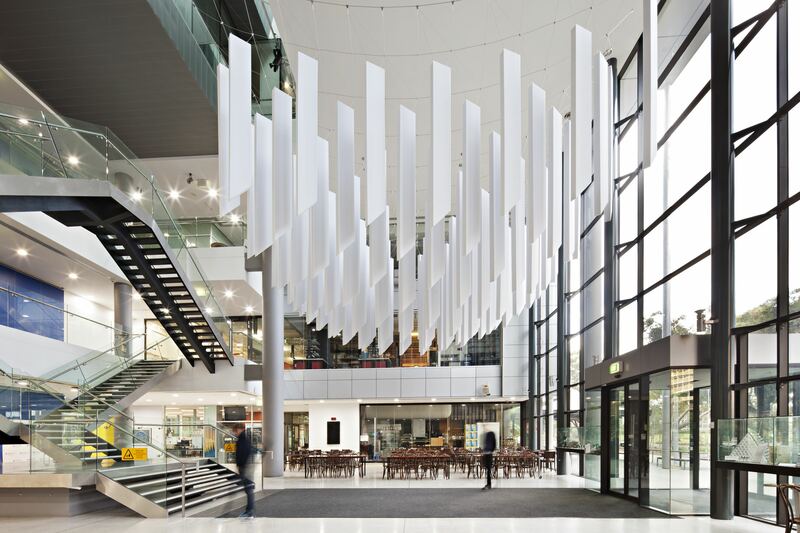 A sound engineer had calculated that if so many square meters of sound absorbent foam was equally spaced in the air of the foyer, then it would make the space far less noisy. 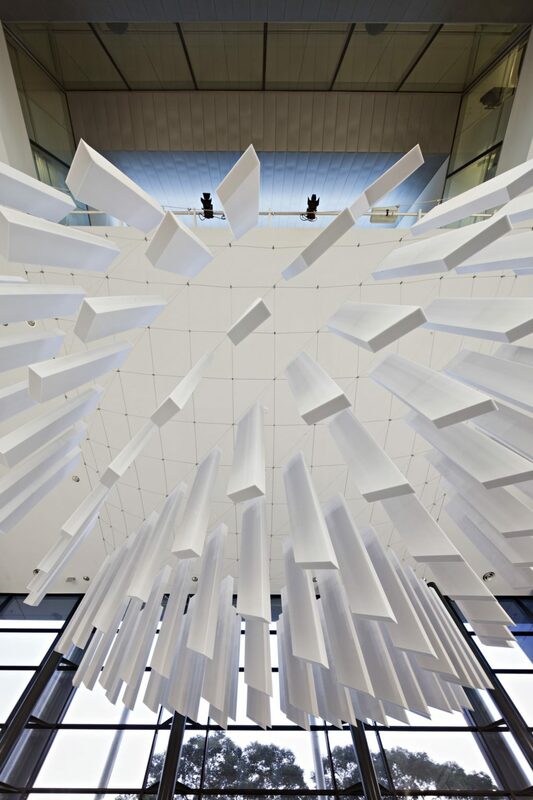 The challenge was to support the array of foam blocks in mid-air without detracting from the aesthetic of the space. 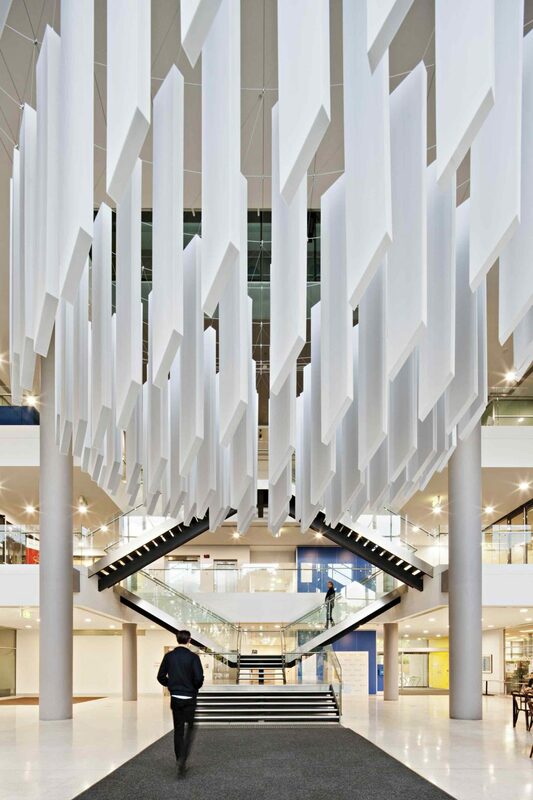 Working with the architect Andrew Simpson, and the structural designer Tensys, Ronstan Tensile Architecture was able to provide a solution in the form of a 3D suspended cable net. The cable net carried no load except that of the light foam panels which were designed to absorb the sound. The main body of the net was pre-assembled in the Ronstan factory and then attached to the edge cables on the ground and lifted to surveyed column connections. The only adjustment in the system is in the four link cables to the columns; there is no adjustment in the net. The cables used were ACS2 and ACS3 variants. The edge cables are Diameter 6mm and the four corner link cables are Diameter 8mm. The net cables are 4mm in diameter and a range of custom and standard stainless steel components were used to set the position of cable crossover points and to suspend the foam blocks. The blocks themselves are suspended on 1mm diameter stainless cables. The final result not only achieves the functional requirements, but adds an extra layer of complexity and interest to, and beautifully compliments the original architectural vision.